Almost every brand now has a makeup setting spray and I wanted to review a few. I completely think a setting spray is worth it, I moisturise, prime, liquid, powder, sometimes i even bake but I still set my makeup. I’ve put a lot of effort to get HERE. My fav is the DE-SLICK Oil-Control Makeup Setting Spray but all of the range is great ALL NIGHTER Long-Lasting Makeup Setting Spray and CHILLCooling and Hydrating Makeup Setting Spray. I have super oily skin and this keeps my makeup in place and stops it from going ANYWHERE. 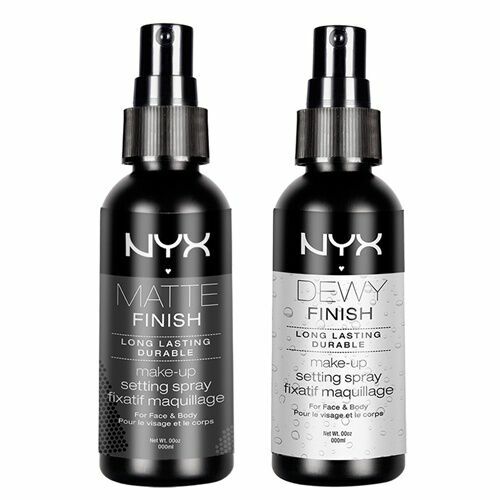 I not the biggest fan on the NYX setting spray, yes is does get rid of the shine but I don’t get the longevity that they promise. Really gentle product and it was so easy to put on plus its alcohol-free, I found that my makeup lasted all day. No complaints here. I have to say that it’s not a setting spray its more of a refreshing spray, it smells amazing but it doesn’t increase the staying power of your makeup. But a good tip with this one is to keep it in the fridge it’s really refreshing. But Makeup cheat, if you have forgotten your makeup setting spray you can always cheat and spray hairspray. Love the review. I’ve always been looking to try a setting spray but never did any research to it. What’s the price for urban decays? If you have L’oreal there, they have a great one called Infallible Pro Spray & Set! I have really oily skin and this one works really well to control my oil!